Namco Bandai is doing it. They're going for it. They're aiming to unleash a hot tamale and do it in style. They're going all out. 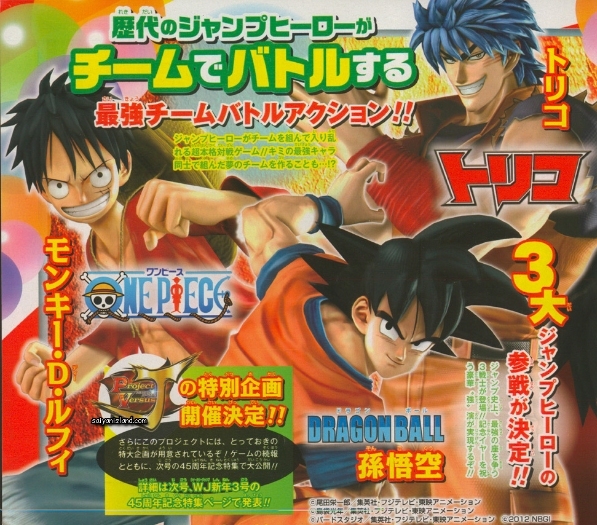 That's right, it's One Piece Vs Dragon Ball Z, tentatively titled Project Versus J and a new scan has surfaced. Saiyan Island appropriately discovered the scan which shows Goku and Luffy balling it up on the page. Check it out below. Speculation has already run rampant that the game could be some epic fighting game crossover with characters from DBZ, One Piece and Toriko. There's no look at the game, no idea what the game will be about and no further details. Usually, though, when a company tosses in the “Project (insert letter here)” it means that the game is extremely early in development, either prototype stage or barely entering pre-alpha, and could go either way. We definitely know that the game is coming, it's just that it's pretty early on and so we're left with the guessing game for now. We don't even know what platforms the game could be on (which leaves speculation open for a possible next-gen debut title). I just hope it's not some silly mobile cash-in game. That would be weak. If Namco really wants to cash in, they better do a Naruto vs Dragon Ball Z game, that would be epic to unforeseen proportions.